Does your business have $4 million it can spare if your data is lost or stolen? That’s the average total cost of a data breach in 2015, coming in at $158 for each piece of sensitive or confidential information, according to the latest study from Ponemon Institute and IBM. That isn’t a spike in cost — the study says the average cost has remained relatively stable in the many years that it has run. And, the risk you’re facing is more than just having to pay for the cost of the lost data. Companies just like yours that experience a data breach face a bigger financial consequence of lost business and the significant cost it takes to win back trust. So, you’re spending a lot on your cybersecurity needs, giving IT the tools they need and vetting your vendors before you integrate with new platforms or people. Those are great steps for the beginning of a relationship and the data lifecycle. Today, however, it’s time to talk about the end of the data and infrastructure lifecycle, where it’s easy to overlook risks: data destruction. 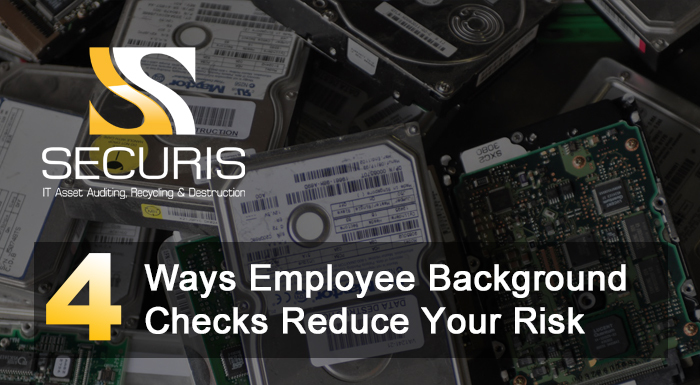 People are at the heart of all breach risks, so we at Securis ensure that everyone on our staff goes through a comprehensive employee background check and is monitored if they might have access to your information. We think this should be a requirement you give to partners who handle your data, no matter where they are in the data lifecycle. Here are four chief reasons we believe that employee background screenings are an absolute must for all of your data-related partners. Insurance policies and lawyers enter the picture almost immediately once a breach is detected. And, if it’s traced back to the staff or partner who was handling data ready for destruction, your policy will likely have requirements for you to remain covered. One of the biggest requirements is that your data destruction vendors have an audit process so they can track employees who had access and may have led to a breach. One of the biggest trends we’ve seen is the requirement that anyone handling your data destruction be fully vetted – meaning a background check in most instances. Plus, if you’re able to show your insurer this information, you’ll demonstrate that you took active steps to limit the likelihood of a breach, helping you make a successful claim. While limiting liability is great, it would be even better if you could limit the likelihood that your data was breached at all. Background checks help us verify employee information and screen out potential issues so that we, and you, don’t have to experience concerns. Most background screening companies say that 40% to 50% of their checks end up flagging substantial errors, omissions, or inconsistencies with what candidates tell potential employers. We use screenings to ensure you are secure. And, when every employee knows that they are screened and then monitored, it helps reduce the likelihood that a breach attempt will occur. It makes sure everyone is part of the overall commitment to the duty of care when dealing with your sensitive information. Your data destruction company should use multiple avenues to keep your data safe. Every security measure is a useful tool in preventing loss and liability. Employing background screenings is smart. It should be seen as an additional layer designed to protect you while reminding employees that security is a chief concern. And finally, look at the background check from the perspective of a data destruction company like Securis. We don’t want to hire anyone who poses a threat to your organization or ours. We view the cost of a background check as worth it, especially when compared to the cost of a bad hire who poses a theft risk. By providing you with information and verifying all our employees are fully screened, we’re saying that we respect your business and your data. Even the most expensive background check on the market is less costly than a bad hire. Background screenings are just one part of our overall commitment to robust ethical standards and internal integrity. Ask your partners if they do background checks, and follow up with questions about what information you look for — remember, it’s okay to ask. Here at Securis, we work with Kroll Incorporated for our data destruction employee background checks and verifications. The New York-based company operates in dozens of countries across the globe and performs searches and data reviews in more than 30 languages. We’ve found Kroll to be a reliable screening partner. Securis employees also complete Federal Bureau of Investigation official fingerprint cards. This information, as well as results from background and security checks, is kept in each employee’s file for customer review. It’s our way of protecting what’s important to you.